It's a long one today. We apologize for all the background noise. We'll have to close the windows next time around! Michele is trying to wrestle her Rikke hat WiP out of Marigold Jen DK. Jill finished her Inara Wrap by Ambah O'Brien in Artyarns Milano Fade. 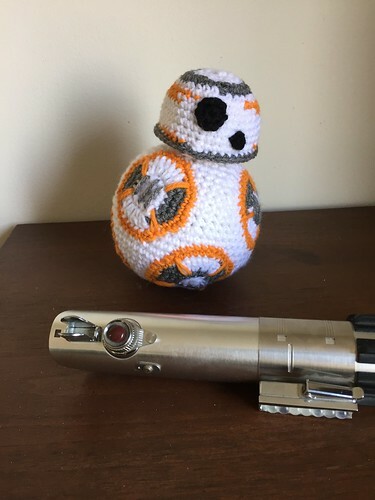 She also finished her BB-8 amigurumi, using BB-8 inspired by Star Wars: The Force Awakens by Casey Barnes out of Red Heart Super Saver in White, Grey Heather and Cascade 220 in orange. She did a few rows on her Banded Lace Pullover by Traci Bunkers. She is frantically working on her Amille shawl by Emily Ross in Tosh Lace Oceana for the Ravellenic Games. Her project page here. Michele has rediscovered the Pterotactyl shawl by Marc Smollin. She likes the Welcome Back Garter stole by Casapinka. She found an edging modification to the Half Granny Square Shawl by Anastacia Zittel that made her want to make another one (can't find the mod to link!). A similar pattern is the Wearever Wrap by Heather Walpole. Jill is looking through her Joji Locatelli patterns for the Joji Fall KAL starting August 15. She could knit Recoleta, Imagine When or Fine Tune. She has a couple new favorite shawl patterns: the Rookwood by Mindy Wilkes and the Good Vibes shawl by Nadia Cretin-Lechenne. There's a cute, giant, free scrubby pattern, the School of Fish Scrubbies by Michele Wilcox. Bee Mice Elf BFL gradient set in Beachcomber and SW Merino/Merino/Silk gradient set in Wine Mixer.